Park advocates want to keep the unique green space, while affordable housing champions say it’s needed for low-income seniors. But lost in the noise of the opposition is the fact that the development going up on Elizabeth Street isn’t full of luxury condos would block out the sun: The development, known as Haven Green, is a Habitat for Humanity-backed affordable housing complex specifically designed for low-income seniors, a population that desperately needs housing. It’s also backed by community members who’ve fought to save Rivington House, as well as the neighborhood’s City Council member, who staked an election on it. Looked at through another lens, the fight is a common, though much less sympathetic, story in the history of New York City: a neighborhood banding together to fight affordable housing. The history of the lot that the Elizabeth Street Garden sits on is a long one. Originally home to a public school that was torn down in the 1970s, the land, between Elizabeth and Mott streets, was slated to become Section 8 housing. Those apartments were never built, and eventually the abandoned (but still city-owned) lot was leased to Elizabeth Street Gallery owner Allan Reiver, who planted greenery and used it to store sculptures. Until 2013, the garden was open to members of the public who entered through Reiver’s gallery. But that year, a handful of community members convinced Reiver to let them open an entrance on Elizabeth Street in return for volunteering to take care of it. At the same time, City Council member Margaret Chin asked former mayor Michael Bloomberg’s administration to include the lot as an affordable housing component to the Seward Park Urban Renewal Area (SPURA, later renamed Essex Crossing), a request that was granted by the Department of Housing Preservation and Development (HPD) in 2012. Not long after that, Community Board 2 began fighting the effort to develop the lot, proposing a series of alternate sites in the district. The most popular is located at 388 Hudson Street, about a mile away, and is owned by the Department of Environmental Protection (which itself is supposed to be turned into a park). Meanwhile, HPD issued a request for proposals for the Elizabeth Street site in 2016. Along the way, those who want to save the garden racked up support from local electeds who weren’t Chin, as well as friendly press and celebrity might in the form of Gabriel Byrne and attorney Norman Siegel, the former executive director of the New York Civil Liberties Union. All of the heavy artillery has not been a high-profile NIMBY effort, says Jeannine Kiely, the president of the Friends of the Elizabeth Street Garden; instead the group is demanding a more democratic process. But in the face of a thousands-long waitlist for affordable senior housing, Chin questions why the city has to make a choice between two different sites as opposed to utilizing both of them. Haven Green, which is being developed by Pennrose (a developer that’s worked on the Prospect Plaza NYCHA/affordable housing development), will include 123 studio apartments, 15,000 square feet of ground-level retail, and an 8,000-square foot open space as a replacement of sorts for the current garden. The open space will be managed by Habitat for Humanity, which—along with elderly LGBTQ advocacy organization SAGE and RiseBoro Community Partnership—will provide programming and support for the residents of the building. A rendering of the proposed Haven Green development. 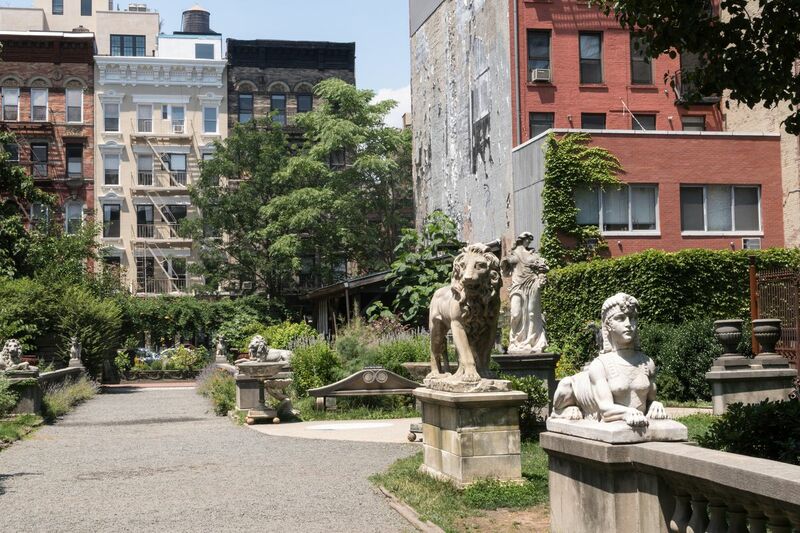 And rather than a decades-old community space—a “cornerstone of the neighborhood” since the 1990s, as one story about the garden described it—Chin said for most of its life, access to the garden was a perk of being friendly with Reiver. The Friends of the Elizabeth Street Garden say they’re fighting for an area that’s drastically lacking in city-owned green space. CB2 is one of only four Community Districts classified by the Mayor’s Office of Environmental Coordination as “underserved” by green space (defined as an area with less than 1,000 acres of green space per 2.5 residents). Still, long-promised parks are on the way, and neighborhood data compiled by the Furman Center for Real Estate and Urban Policy also shows that while 99.8 percent of the residents of the Lower East Side and Chinatown live within a quarter mile of a park, only 7.4 percent of the neighborhood’s housing units are affordable for people making 30 percent or less of the area median income. Haven Green would, in theory, serve the latter need: According to a presentation from the developers, annual income limits for the studios will range from $18,774 to $37,548, with 72 of the units set aside for people making 30 percent AMI or less. For Benjamin Dulchin of the Association For Neighborhood and Housing Development (which has endorsed the project), the competing claims of parkland versus affordable housing have to be weighed in the larger picture of what the neighborhood needs. 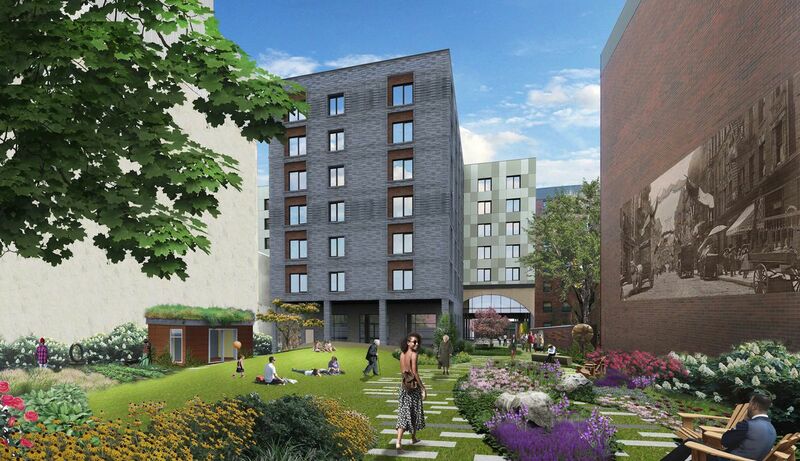 The neighborhood also doesn’t lack for community gardens as K. Webster, a neighborhood activist with Friends of Rivington House, pointed out in an op-ed of support of using the land for affordable housing. Class issues also inform the attachment to Elizabeth Street, Webster argues. “I think it has to do with what people perceived as beauty without any sense that that’s … determined by your culture, your class, you race sometimes, what you consider beautiful,” Webster says. “There’s people who will disparage the M’Finda Kalunga garden, which is in Sara D Roosevelt Park, and that’s one of the most beautiful gardens there is going.” And like Chin, Webster remembers the garden as more of a luxury item. “It never felt very open to me,” she says. The insistence that there’s more support for the project than is seen at community board meetings might be tough for garden supporters to swallow. But the fact remains that however narrowly Chin won her last primary, and then the general election—despite garden supporters throwing their weight (sometimes questionably) behind her opponent—she still won. As the old chestnut goes, elections have consequences.